Gringo Records - SPIN SPIN THE DOGS - "Leave Me In Leicester"
"I mean I wasn't that bothered to be honest but y'know". The band needed members. Ben Woods began by playing drums, but then some time in 2004 he disappeared. His departure heralded the arrival of a new drummer, James Smith, and a tenor saxophonist, Cyril Diels. Quietly, and with a great amount of respect, they also disappeared. A spate of disappearing band members followed, until two years and a few successful (notorious?) live performances later the group recorded a 10" EP named Cats!, recorded in the basement of an East London pub. Released with characteristic ill-timing in 2005, the band promptly went on indefinite hiatus as current drummer and principle songwriter John Wilson did as all Spin Spin The Dogs drummers do, and disappeared. This hiatus was brought to an end in 2007 after John was discovered in South Australia. Realising there is more to life than sun, sea and warm burnt meat, he returned to the UK, tail between legs, and put the band back together. Impatient to return to live performance, highly regarded and never to be underestimated avant-garde noise musician Luke Younger was drafted in to play guitar for the band in late 2007. And thus a new golden age for the band was entered. A band is often a collaborative venture, requiring compromises between individual members and their opposing visions. With Spin Spin the Dogs this is not this is not the case. Each member of the group is invited to believe that the vision is his alone. In fact, no one person can control Spin Spin the Dogs. The music and performance is driven and directed by an invisible hand of name unknown and intention withheld. The impression of the each member past and present is that they are the masters of their own destiny; this is their joyous delusion! 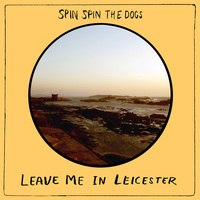 Spin Spin The Dogs invite you to share in this joyous delusion - to transcend notions of the ridiculous and the sincere. Recorded by Rory Bratwurst at Pacific Rim. 500 copies on black vinyl. Comes with digital download code.